Lauren Bartley is part of a team developing a blood test to detect dementia. A blood test can reveal many things about your physical health, such as your blood glucose levels or an iron deficiency. But what if a simple blood test could reveal what’s happening inside your brain? As the Biomarker Study Coordinator, I see each participant involved in frontotemporal dementia and Alzheimer’s disease research at NeuRA and take a sample of their blood for analysis. At the moment, if your doctor suspects you have dementia, you are likely to undergo neuroimaging to look for changes to your brain structure and shape, as well as cognitive and behavioural assessments looking for changes in the way you think, act and process information. When people only have mild changes, it can be difficult to accurately predict the underlying disease process, which can be frustrating for the affected person and their families. At NeuRA, we are currently investigating the concept of a blood test for dementia, with the hope that one day clinicians will be able to easily and quickly discriminate between frontotemporal dementia and Alzheimer’s disease, the two most common forms of younger onset dementia. Our hope is that this test could further reveal if any medications or therapies might be effective in reducing symptoms and halting the progression of illness. This is important because a medicine that benefits someone with Alzheimer’s disease is unlikely to be effective for someone suffering from frontotemporal dementia. Our blood test will screen for particular proteins in the blood associated with dementia: Beta Amyloid, Tau, TDP-43 and FUS. We know these proteins are responsible for causing the brain changes in both Alzheimer’s disease and frontotemporal dementia by having performed previous pathological studies on the brain tissue that has been generously donated by former research participants both in Australia and around the world. These proteins are in everyone’s brains as they age and they carry out important functions in supporting the brain cells. But in some people, these proteins start aggregating in a harmful way that can kill the brain cells and cause the symptoms of dementia. Our prediction is that a person who has pathological levels of protein massing in their brain will also have increased concentrations in their blood. 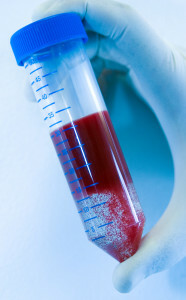 It’s important for our study to screen the blood of a significant number of older healthy males and females to act as a comparison and help us understand what the respective protein concentrations are in people with no presentation of dementia symptoms. The people attending the Frontier research clinic at NeuRA to volunteer for frontotemporal dementia research are generally aged between 50 and 75 when their symptoms begin, so we have a wide range of ages to match for. Often the supporting partners of our participants act as controls in the study, and are happy to be offered the opportunity to contribute to our research. Our study is a little more than half way through and so far I have collected blood samples from over 500 dementia-affected participants and controls. It’s important to obtain bloods from people with a variety of symptoms so that we can best correlate these symptoms to a protein profile. I am also collecting further samples from participants at different in their illness to see if there are changes to this profile as the condition progresses. The only way to quantify our study and determine the accuracy of our results will be to confirm the pathological protein at the end of the participant’s life through our brain donor program (see my previous blog post). In this way, we can ensure our results are meaningful. The blood samples that I have collected are now in the very early stages of being analysed by the biomarker team, and over the next 18 months we will learn more about the feasibility of the blood test for dementia in everyday community healthcare. We want to be very certain of the accuracy of the test before its release. In the meantime, anyone who has concerns about their memory, or who has had changes in their speech or ability to understand language should discuss them with their GP. Sometimes it’s easier for a loved one to recognise these symptoms, along with other clues like changes in personality or behaviour that might be more than just a ‘mid-life crisis’ or the general process of ageing.